The Longmen Grottoes, 12km (7 miles) south of Luoyang, stretch for 1km (0.6 miles) on the west bank of the Yihe River. The area is a made up of 1,350 caves, bubbling rivers and limestone cliffs. 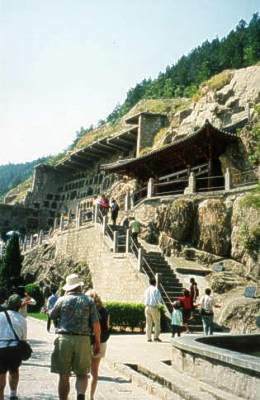 The Longmen Grottoes are a treasure house of ancient Buddhist cave art. The work began during the reign of Emperor Thihe of the Northern Wei period (535-556) and lasted for 400 years. There are 1,952 grottoes, 750 niches, 40 pagodas, and more than 100000 Buddhist statues, big or small. The most well-known caves are Guyang, Binyang, Yaofang, and Wanfo (Ten-Thousand-Buddha). 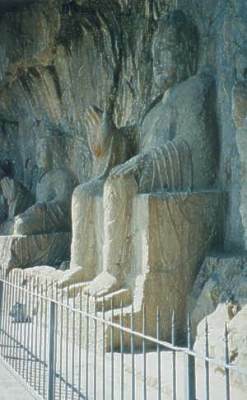 The largest Buddhist statue, 17 meters high, is found in Fengxian Temple. The grottoes are now one of the three biggest such sites in China along with the Dunhang and Datong Grottoes.